Zune is a free media player developed by the Microsoft Company. 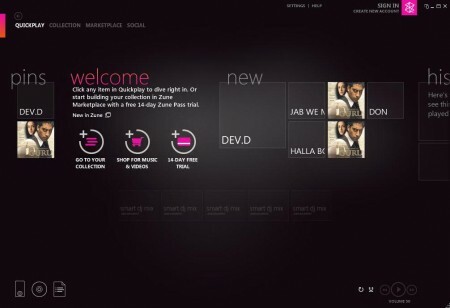 Latest version of Zune Software comes with all the features that you look for in a good music player and media manager. 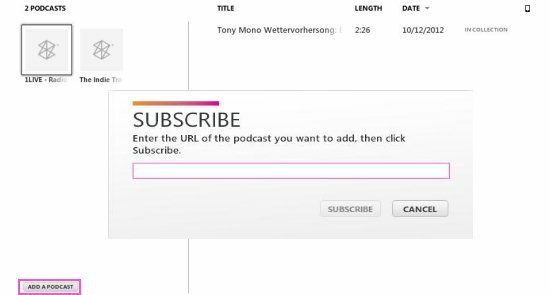 Zune software can manage your entire media library, create smart playlists, download podcasts, burn CD, and rip CD. My first good portable media player is Zune, and I still use it. Some of the features that I love about Zune player is that it inherently lets me stream radio stations and it syncs with my PC wirelessly. On top of that, Zune software that Microsoft provides is really good as well. Burn CD, and Burn DVD with Zune Software: Zune software comes with a built-in free CD burner and free DVD burner that you can use to burn CD and DVD. This means you do not need to install a separate free dvd burner. You can burn audio CD, or data CD/DVD with Zune software. You can also choose between various burn speeds. Zune makes it extremely easy to burn a CD or DVD. Just select the files that you want to burn and drag them onto CD icon at bottom of Zune software. This will create the burn list. Then you can burn this list to your CD. Go to Settings tab, and click on option for Rip. Here you can choose the format that you want to store Ripped CD in. You can also choose to auto Rip a CD when you insert it. If you have not selected this option, you can just browse CD contents in Zune software, and drag them to CD icon at bottom to rip it. Devices Connected: This software can detect Windows phone. It can also wirelessly sync with Windows phone and you can manage all the media files of your phone from this media player. 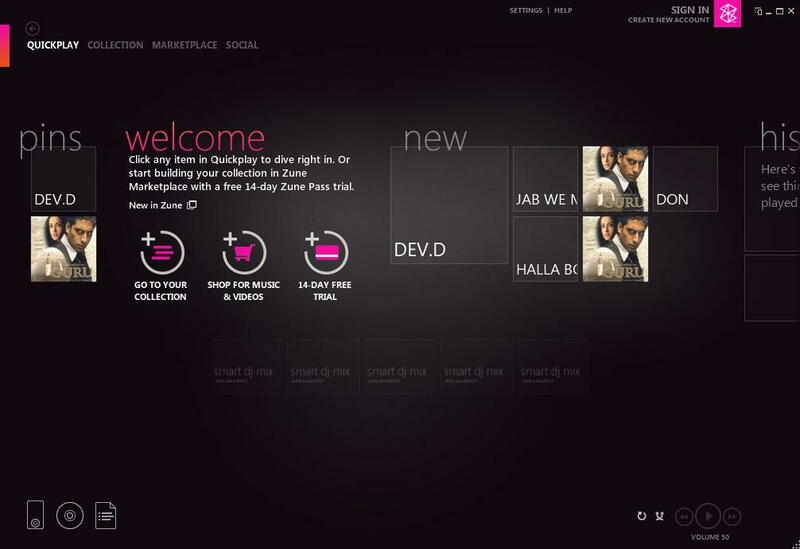 Latest version of Zune software comes with a really cool interface. Everything is very intuitively organized, but still there is no pattern to it. All the functions are available within 2-3 clicks. What I like most is Home Page. Instead of a fixed layout, it can extend to both Left and Right side of the screen. As you move your mouse horizontally, it also moves the options. So, Home page has more options than it could have otherwise accommodated. Really nice design. To access the features use the navigation buttons located on top right as shown below. Use the three options quickplay, collection, and marketplace. Zune software also comes with QuickPlay option that lets you quickly play your favorite media files. You can setup Quickplay list with one click, and it will show up when you start Zune software. 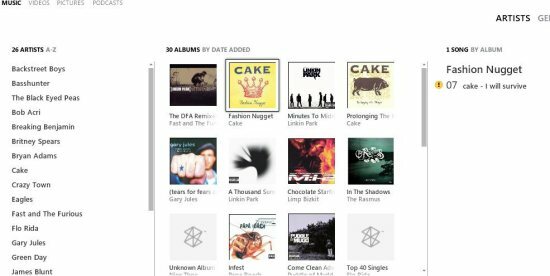 Smart DJ: Another interesting feature of Zune software is that it lets you create playlists quickly by specifying your favorite artist, or selecting your favorite song. Zune then finds similar songs, and creates a playlist around that. You can save the playlist for later, and just use it for random playing. (I still like the concept of Mufic MusicFinder more). Music: All the music files that you have added will be displayed here and you can play them or add them to your smart DJ. Videos: Here you can see all the videos that are added and you can play them here. Pictures: All the picture formats will be automatically synced from your default picture folder. You can change the folders to sync in the settings option. In marketplace you can browse for your favorite videos and music and buy them from here. You can purchase and download from here itself. Even the installation of Zune is really simple. You do not get any windows that ask you tons of questions. Instead, installation comes with default selections that make it extremely easy to install Zune software. Of course, you can also choose to customize settings if you want. Apart from all these features, Zune software is a really good audio and video player as well. 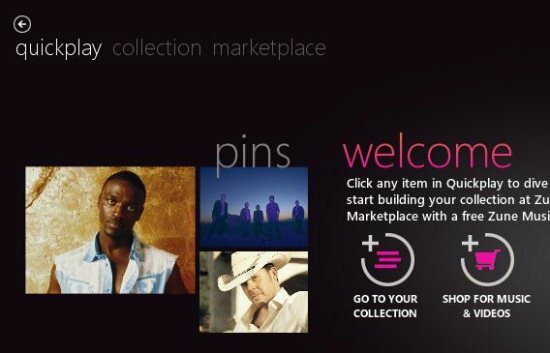 Microsoft has really raised the bar for media players and media library managers with the latest version of Zune software. I use iTunes as well, but it can’t be compared to Zune. Try out Zune. You will be happily surprised.